Working abroad is working away from your homeland. Nowadays it has become a fashion to move abroad and work in order to earn money. People move from one country to another in search of the job or to settle. Now at least one member from the family is surely seen either preparing to move abroad or has already settled there. Most of our answer would be “YES” and it is not at all surprising. There are plenty of reasons for it and every individual will have their own reasons to justify their decision. Though there would be few difficulties initially when you are working in a foreign country, the benefits which you get will help you cover up all of them. Many dreams of moving abroad and it is quite obvious. If you are getting good employment opportunities, better salaries, perks, and good work culture can get an improved lifestyle, then working abroad can surely be tried. But before taking any decision, you need to think of a few points which are listed below. Great chance to network and meet new people and make new friends. You become a world citizen. Moving to a new country for working is no doubt a great opportunity. Now before moving out, there are a few things that you need to know. Here are some of the ways to earn money when you travel around the world. Living and working abroad nowadays have become a great trend, but as every coin has two sides it also has few pros and cons which are mentioned below. The following mentioned are few benefits of living in foreign country and working in foreign countries. 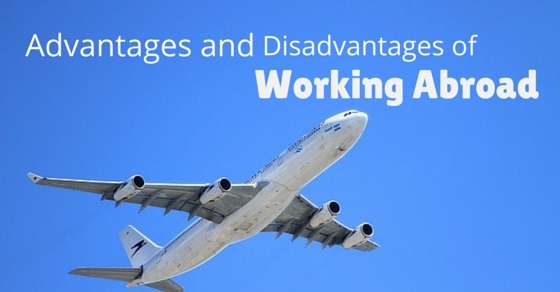 People who work abroad live with high standard and their lifestyle changes to greater extent. Life in other countries is altogether different than the home country. If we move from one place to another, we experience difference in all the things, be it culture, style of living, food habits, language, atmosphere, ambience, likes, dislikes and many other things that at times remain unnoticed. This is one of the first advantage of working in a developed country. The people who choose to work abroad experience different religious as well as working cultures. They get to learn a lot about more than one culture. It enhances their knowledge and also makes them aware of their surroundings and the whole world. Working abroad also helps a person to travel. One gets to see the whole world along with doing work. It can also act as refreshment from work for few days and can make a person more excited moving to another country for work. Moving from one country to another helps a person to know diverse languages. Apart from the mother tongue, one learns German, French, American English and many others according to the country one lives for the work. It is heard that the people in abroad has the best quality of working in a team. A person learns how to work in team and also gets to know the criteria and methods by which they work. One gets to learn a lot by visualizing as well as working among them in an office. One gets to earn a lot, thus building a strong bank balance. A person if moves from India to America, will earn in dollars and as the value of their currency is more, a person will earn more, this will help in near future. As we move away from our homeland, we come across people with different cultures, languages, ideas, beliefs, methods of working, nature and so on. This way meeting different people from different countries, one gets to learn how to tackle people of heterogeneous nature. This adds to skill of handling a large scale company with many employees. Working abroad gives weight to the resume. It helps you to stand out of the crowd. Wherever a person goes, he or she is given the preference as he or she gets an international experience. So, in this way such a resume is given more preference than any other. International work experience is first and foremost choice for the competitors. A person with international experience has more chances of promotion and success. A person gets success and promoted in early stage just due to the stamp of an international experience in a particular field. It helps you to develop at faster rate and helps further your career at quicker rate. A person is able to improve his communicative skills as he or she come across language barriers and many cultural differences. By dealing with all such barriers one learns the skill of communicating with people of different cultures and languages. In order to move abroad and work there, the first and foremost thing required is a hefty amount of money. If you cannot spend a lot of money, you cannot think of working abroad and settling there. So, this becomes an initial hindrance to work overseas. This is the first disadvantage of going abroad. A person if works overseas have to move from one country to another and this way a person is not able to stick to one thing. Such type of fluctuation in work is a great barrier and diverts one’s mind, affecting the work to a larger extent. As one has to move frequently from one place to another, one may feel lonely as the friend circle and social life is affected on the whole. Missing the old friends and family i.e. feeling homesick badly is the common thing. One has to fight all such emotions to move ahead. This is one of the biggest disadvantages of going abroad. As every country has it’s own culture, beliefs, and values, understanding all those immediately is very difficult. So suffering from cultural shock, the difference in the behavior pattern of people from different countries is a great disadvantage of working abroad. A person has to learn a number of languages that too in a short span of time. Learning languages is also a herculean task and if not learned by a person then it can lead to the communication barrier. A person will not be able to understand what other says, neither will be able to communicate well. The person remains void of enjoying all the traditional festivals like Diwali, Lohri, and Christmas and so on. One has to work incessantly without any occasional holiday. This also sometimes frustrates a person and thus affects the work quality. This is not always sure that you will get the best condition to live in as every country does not provide a person with good working condition. It will depend highly on where you choose to live for your work. You never know what kind of people you will come across. Rude or polite, whatever natured a person is, one has to tackle in a smart way as you are working overseas. One must learn the custom and habit of people in the country you are moving. “When in Rome, do as Romans do, is a great tip for people working overseas”. It is not necessary always that you will be relocated at the same post in the next country. For those who think of leaving a country and current post for the purpose of settling abroad should not expect for a guaranteed same post. One may even get less salary than the present. So, one has to be prepared with all such risks one may go through. One may either do not feel safe overseas. No friends, no family, no social life and all such things should be taken into notice beforehand and should be prepared emotionally before leaving for abroad. Every country has it’s own rules and norms of working. Adapting those norms within a blink of an eye is difficult but if the norms are strict and a person fails to attempt according to those rules, one may fall into greater trouble, that may further become a never-ending process. One may get a lower level job or can even get menial work to do in the initial stages in case the experience in the homeland is not good enough. So, for such circumstances, one has to be prepared and be strong enough to handle a difficult situation in case a person comes through. So, above are the various advantages of working abroad and living in a foreign country along with its disadvantages of working abroad. No matter how many disadvantages it has, one must look forward with a positive attitude towards the advantages and move ahead in life. Everything in life has pros and cons, leaving aside the cons, one must look ahead and choose what one feels to be right. Every person aspires to go abroad, work and finally settle there. In order to go abroad, one has to start from the scratch and work accordingly. It is not impossible but yes difficult enough. Moreover, the grass is always green on the other side and before getting attracted to the greener portion of the grass, one must get through the darker side too. As knowing both comforts and difficulties are must before starting any new work.